Pioneer BDP-320 review | What Hi-Fi? Regular readers will recognise the Pioneer BDP-320 from previous tests this year. Back then it weighed in as the most expensive player on the roster, but it managed to comfortably justify the extra outlay with a level of performance that left most of the competition trailing in its wake. Certainly this Pioneer machine makes plenty of friends given the once-over in the cold light of day. It looks like a product that you'd happily pay a few quid extra for, with its svelte profile and serious-looking, substantial remote control. Switch off the lights and it becomes an altogether more fumble-filled affair, however, with no light on the remote and the tiniest of eject buttons on the front of the display. Still, we know the BDP-320 is worth perservering with. It was the sonic ability of the machine that really had us on our toes earlier in the year, and watching Rocky Balboa on Blu-ray, it's clear this Pioneer still has plenty to sing about. It packs in some serious scale and authority, filling our room with powerful, dynamic sound. Visually there's plenty to like, too, with good insight, smooth motion and deep blacks combining. Only the brightest hues show the BDP-320 looking perhaps a little over-exuberant. Naturally the deck is fully specified. There's onboard decoding of all HD audio codecs, BD-Live support via Ethernet, 1080p/24fps playback and x.v.Colour support. 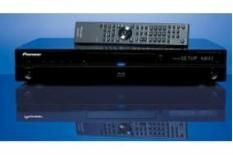 You won't find any sign of multichannel analogue outputs or indeed a digital coaxial output, should that be a key concern for you. The GUI looks smart and is effective enough, if comparatively a little sluggish. Upscaled DVDs look and sound good, with Fast & Furious delivering insight to pictures, sharp edges and natural skin tones. Soundtracks are crisp and clean, too, if lacking the extra sparkle delivered by other players. And you certainly won't find reason to gripe should you be asking your player to do the upscaling. Flick on a CD and the Pioneer does the job, sounding as confident as any Blu-ray player around this price-point. We were curious to see how this Pioneer fared against fresh, more competitively priced products. We're happy to report the BDP-320 more than holds its own for simple sound and vision performance.